HOW do we get a glimpse into the life and times of our forefathers? What is it that connects us with our heritage? How can we relive the dashing moments of the era gone by? 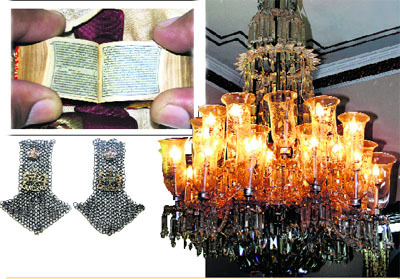 Clockwise from top left: A copy of miniature Guru Granth Sahib, printed in Germany for distribution to the British Sikh troops; a chandelier that once belonged to the Maharaja of Nabha; the two heirlooms are prized possesions of Amar Daljit Singh of Ludhiana; and a pair of epaulets of the 2nd Patiala Lancers, which belonged to the grandfather of Dr A. S. Sekhon of Patiala. Perhaps, family heirlooms hold the answer to this predicament. Many of these have been preserved with great care and occupy a pride of place in many households. These heirlooms are timeless family relics. At times, these are as invaluable to us as our children. "I draw all my energy and power from the classy heirlooms that have been preserved in our family. It tells me about my ancestry and the glorious life my forefathers had," reminisces Yudhvir Singh of Retgarh, whose great grandfather Raja Gurdit Singh was the Prime Minister of the erstwhile Patiala state. The preservation and upkeep of these heirlooms, at times, is like a meditative ritual for the families, and is carried on from generations to generations. "I have deep sentiments attached to these. These objects came from my ancestors and would be passed on to my descendants," echoes Amar Daljit Singh of the Malaudh Sardars, who were at one time responsible for the administration of 84 villages in Ludhiana district. There are certain heirlooms which are more than 150 years' old. But these have been so well maintained that these still appear to be new. Yudhvir Singh says, "The Afghan war was fought in 1878, and 580 men under the command of General Daya Singh from Patiala state fought in that war. General Daya Singh, who was my great-great-grandfather, won a medal for his chivalry. It is a timeless memorabilia of our family and we have taken pains to preserve it, even the original maroon-and-blue ribbon of the medal is intact. It is a prized possession adorning the wall of our home." For some patrons heirlooms are now a part of family folklore as well. Shares Dr Sekhon, "We have a family sword going back to 1760, when one of my ancestors, Diwan Charhat Singh, was the revenue minister of Patiala state. It is a ceremonial sword with a gilded gold hilt. The scabbard is made of maroon velvet cloth. Every groom of our family carries it at the time of his wedding. Interestingly, there is a portrait captioned as "Sirdar's of Patiala" adorning the walls of Victoria Albert Museum in London. One of my ancestor features in that photograph with the same sword in his hand." Certain heirlooms are surely one of a kind. These neither have a replica nor is their "colonial cousin" found somewhere else. Some of these heirlooms are in the possession of Amar Daljeet Singh of Malaudh near Ludhiana. "I have a miniature Guru Granth Sahib. The measurement of this holy relic is in inches only. It is housed in an almirah with full sanctity. There were only 10,000 of this kind of Guru Granth Sahib, printed in Germany for distribution to the British Sikh troops. My great-grandfather had fought in that war and thus we have this relic occupying the pride of place in our house," shares Amar Daljeet. He further adds, "My forefathers bought some chandeliers after the death of the maharaja of Nabha in an auction in 1908. These are made from pure Czechoslovakian glass. There is a provision for 32 candlelights in it. These adorn the roof of our drawing room even today. Even the care and maintenance of these chandeliers is quite easy. We usually get them dismantled and after washing they are put together again." At times, heirlooms present a classic case of peeping into the mindset of our ancestors as well. "The glut of cameras in India started in early 1980s. But I have a pocket Kodak camera manufactured in 1909, which was made in the USA. It was possibly among the first batch of cameras to have arrived in India. At times, it makes me wonder that my great-grandfather was not averse to using or handling technology. He was simply a man ahead of his times," shares a smiling Yudhvir.